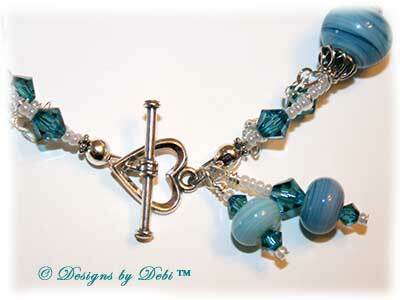 I began this bracelet with some artisan lampwork beads handmade by Lara Lutrick. 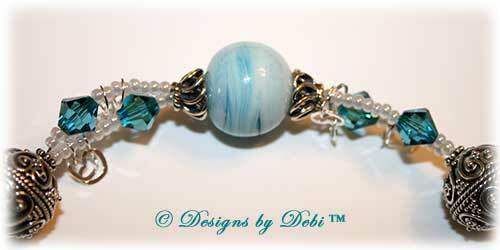 They are round beads with swirls of white and gorgeous caribbean blues. The glass beads are capped with antiqued sterling silver swirled filigree bead caps. 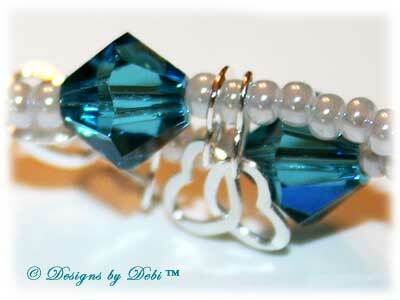 I accented these beautiful beads with Swarovski® indicolite bicone crystals and tiny pearly white seed beads. I decided to go with a heart theme since Valentine's Day is coming. I used exquisitely detailed Bali fine silver round beads with a repeating heart pattern and a sterling silver heart toggle clasp. The bracelet is 2 strands and in each double strand section section I hung a short piece of sterling silver heart link chain from each strand. This would be a beautiful Valentine's Day gift for someone who prefers colors other than the traditional red and pink. January is Cervical Cancer and Cervical Health Awareness Month. 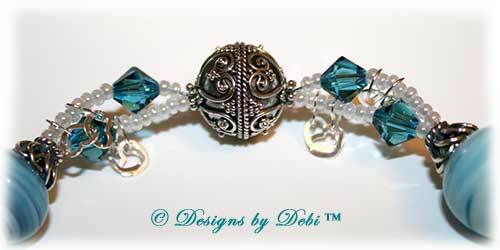 The Awareness Ribbon for Cervical Cancer is teal...the reason for the teal color scheme of the bracelet. And if this is a cause that's meaningful to you, I can add the Awareness Ribbon charm to the bracelet at no charge. The charity I've chosen to receive the donation from this month's piece is the National Cervical Cancer Coalition. ...all of them with a desire to provide a safe and educational place for women that have or had cervical cancer and HPV. The NCCC runs a cervical cancer website; holds fundaraisers and educational conferences; and both develops and participates with others in various outreach, prevention, awareness and education efforts. To find out more about the National Cervical Cancer Coalition or to make a donation on your own, go to www.nccc-online.org. 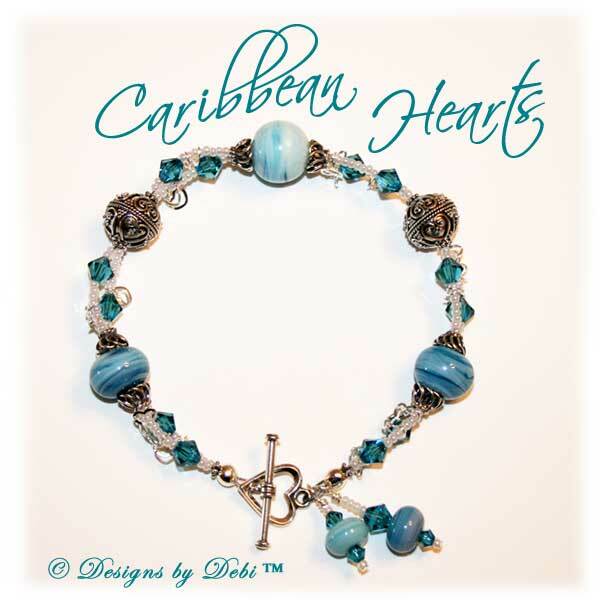 The bracelet measures 9 1/4 inches and will fit a 7 1/4 inch to 7 3/4 inch wrist. If you need the bracelet re-sized, please let me know at time of purchase and this can be done prior to shipment at no additional charge.